Army Spec. 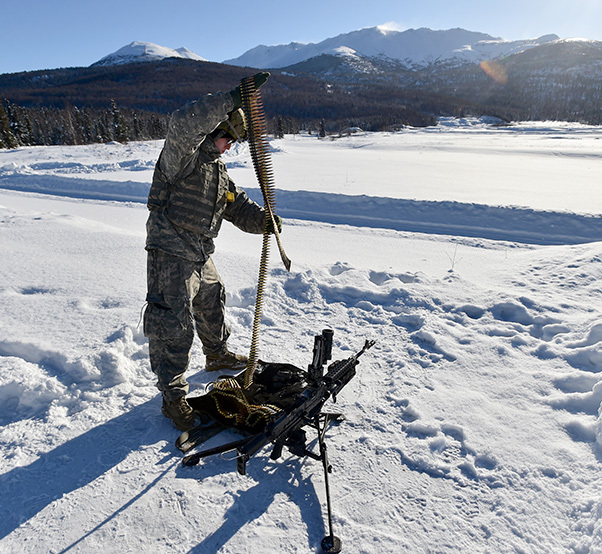 Timothy Sampson, a native of Lancaster, Calif., assigned Delaware Company, 1st Battalion, 501st Parachute Infantry Regiment, 4th Infantry Brigade Combat Team (Airborne), 25th Infantry Division, U.S. Army Alaska, waits to qualify with a M240B machine gun on Grezelka range at Joint Base Elmendorf-Richardson, Alaska, Feb 28, 2017. U.S. Army Alaska is home to the Army’s only Pacific airborne brigade combat team, and maintains the only airborne rapid-response capacity within the Pacific Command.